Big score at a local flea market a few weeks back. 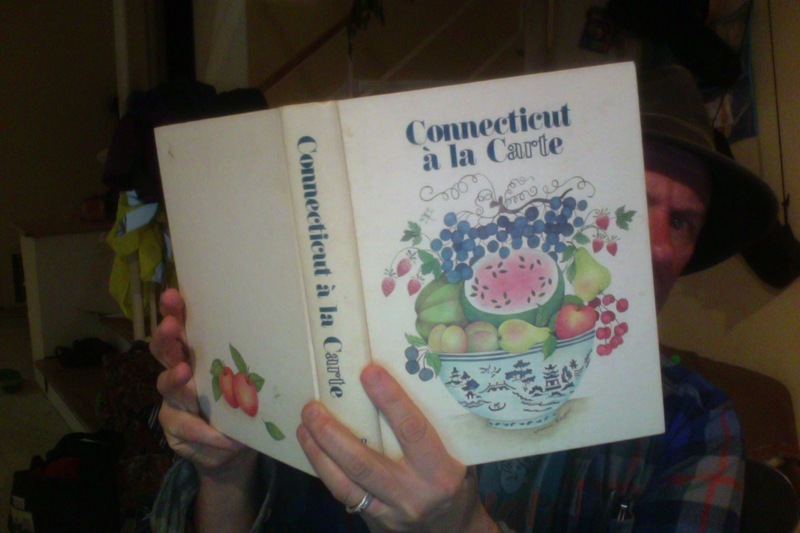 Besides 19 Tom Waits bootleg CDs for a buck each, I got this third-edition copy of Connecticut a la Carte, which I can add to my ever-expanding collection of cookbooks issued by Connecticut arts organizations. Three of those five organizations are still going strong 33 years after Connecticut a la Carte was published in 1982. Nice job, cookbook. Come to the Hartford Stage Cocktail Party! This invitation could have been for one of two significant Hartford Stage productions. First came an elegant 1980 revival of T.S. Eliot’s play The Cocktail Party. This was followed a few months later by a special cocktail party given in honor of the Stage Company’s producing director, Paul Weidner, as he prepared to move into a new profession after providing the city of Hartford with twelve seasons of vibrant theatre. Eliot’s The Cocktail Party was only one of many successful productions which the Stage Company has brought to Hartford since its inception in 1964. Initially, the small local repertory company, under the direction of Jacques Cartier, was housed in a converted warehouse. During the next few years,however, the theater blossomed into a nationally respected regional organization. Today the Stage Company attracts international stage and screen stars to perform in the new John W. Huntington Theatre, located in downtown Hartford. Much of this growth was under the guidance of Paul Weidner who had been an actor in the repertory company and who served as the theatre’s director from 1968 to 1979. The present artistic director, Mark Lamos, has received national acclaim for his debut season and the list of regular subscribers who want to be assured a ticket to every production continues to grow. In addition to six annual productions, the Stage Company sponsors a unique training program for inner-city teenagers which culminates in the production of a musical. Regular student matinee programs include prepared study guides and discussion of each play with the cast. The Company also sponsors theatre classes for adults and high school students. For several years the Touring Theatre has performed short dramas throughout Connecticut and New England. The dedicated auxiliary, called “Stagehands,” has assisted the theatre with a variety of volunteer activities since 1969. So what do they serve for “Hartford Stage Presents The Cocktail Party” anyhow?